You heard it here first: our award winning mask lineup is getting a new addition. 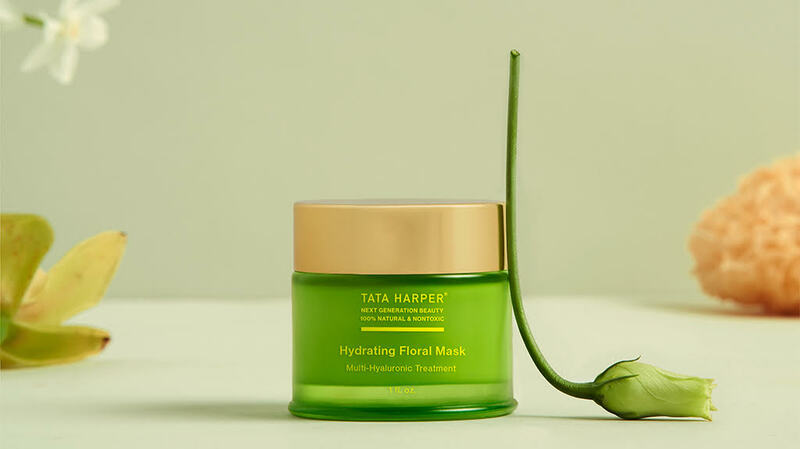 Meet our new Hydrating Floral Mask. This hyper-hydrating, multi-hyaluronic treatment is like a glass of water for your skin. Powered by 1,000 different sizes of hyaluronic acid and enriched with skin-rejuvenating floral blends, this treatment does so much more than just hydrate. Each size of hyaluronic acid works on different levels to quench dry, thirsty skin from the inside out. A 13 flower blend then helps soothe redness and even skin tone while essential vitamins & minerals nourish and comfort stressed out skin. If that wasn’t enough, hyper-hydrating tremella mushroom also absorbs 1,000 times its weight in water to lock-in even more moisture. The result? Unparalleled hydration and skin smoothing powers. Dry skin…you’ve finally met your match! Our unique blend of 1,000 different micro and macro molecular sizes of hyaluronic acid (HA) work on multiple different levels of the skin to hydrate from the inside out. Why 1,000? Because size matters. Each size of hyaluronic acid works on different levels to hydrate skin from the inside out. Smaller sizes of HA deliver plumping, youth-giving hydration that helps minimize the look of wrinkles, while larger sizes of HA deliver conditioning moisture that helps smooth and soften skin texture. This hyper-hydrating mushroom holds up to 1,000 times its weight in water, which helps skin lock-in moisture, maintain barrier function, and smooth skin texture. Chia Seed Water, Sugar Carbohydrate Complex, Sugar Beet Root, Kimchi Ferment, Propanediol, and Glycerin. A Combination of Kangaroo Paw Flower, Red Spider Flower, and Candle Stick Flower provide natural sources of antioxidants ants, ellagic acid and ferric acid, to brighten, even skin tone and minimize the look of redness. Rose hydrosols provide skin smoothing moisture while also helping to calm and smoothe stressed out skin. These hydrosols also give the formula its vibrant, floral smell. Lavender Hydrosol, Banana Flower Oil, Jasmine, Juniper, Lemongrass, Chamomille, Rose Otto, and Clary Sage. This mineral can be found in stream pebbles in the Merume River in Guyana, it’s a natural source of chromium and oxygen that also gives this mask its green color. Derived from safflower seeds, Vitamin F is exclusively compromised on linoleic (Omega-6) and alpha-linolenic (Omega-3), providing skin with a concentrated dose of Essential Fatty Acids. Squalene, Shea Butter, Coconut Fruit, Coconut Oil Blend, Sunflower Seed Oil, Camellia Oil, Alfalfa, Borage, Arnica, Meadowsweet, Calendula, Elderberry, Vitamin C, and Barley. 1. Apply a thick layer over face and neck. Leave on for 20 minutes. Rinse lightly with warm water. Follow with Hydrating Floral Essence. Use 1 to 3 times a week. 2. Whenever your skin needs a little extra love, use the Hydrating Floral Mask as an overnight treatment. Use the mask as the last step in your routine, in place of your usual moisturizer. Apply a think layer, give it a few minutes to absorb and then you're ready for bed. This will recharge your moisture levels overnight so you wakeup looking completely refreshed. 3. The more hydration, the better. Use Hydrating Floral Essence to remove the mask instead of water. After leaving the mask on for 20 minutes, mist the essence all over your face and neck and gently massage, then lightly tissue off any excess product. This will give you even more hydrating and smoothing benefits than rinsing with water or using the mask alone!